Well here we are! Just a couple of weeks away from starting round 2 of the 21 Day Fix Extreme! I have to tell you, when we first started I was NERVOUS about doing this – changing our eating habits, reprogramming myself at the grocery store and in the kitchen. But I jumped in and immersed myself in this program and got out of my comfort zone and started trying new things! You know what? It’s be the best experience ever… granted there were a few bumps along the way but I surprised myself when I discovered that ‘eating healthy’ didn’t mean sacrificing flavour. Funny eh? I have put together a list of 20 of my go-to dinner recipes I’m making when we start our next round of the 21 Day Fix Extreme (and also when I am not) so we won’t find ourselves “hangry” or playing dodge ball with a hard boiled egg. 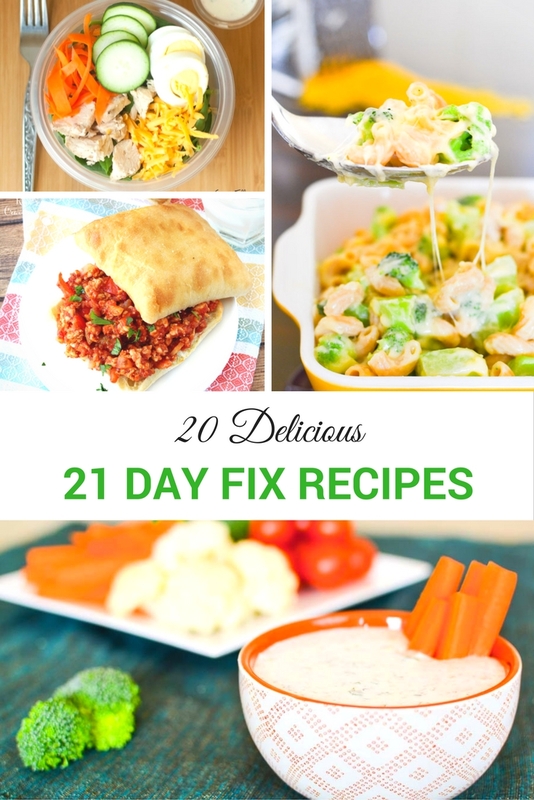 A collection of delicious 21 day fix family friendly recipes – great for clean eating diets! Just click on the links below and snag these delicious recipes. There is something here for everyone! 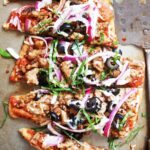 Loaded 21 Day Fix Pizza from The garlic diaries –ohhhh man, it is delicious. Satisfied my pizza craving in a second! 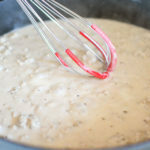 21 Day Fix Sausage Gravy from The foodie and the fix –An easy, homemade turkey breakfast sausage turns the once calorie and fat-laden sausage gravy into a deliciously healthy, 21 Day Fix approved dish that you’re going to have to taste to believe. 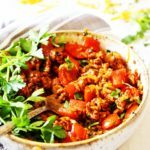 Unstuffed Pepper Skillet [21 Day Fix] from The garlic diaries –Oh, hello there little bowl of deliciousness. You make me so happy with your perfectly seasoned, browned turkey and veggies; hearty brown rice; and melt-y, gooey cheese ?. I am telling you right now, the 21 Day Fix does NOT restrict you from eating delicious, interesting, flavourful food. 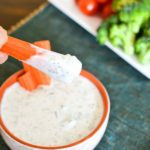 21 Day Fix Ranch Dip from The foodie and the fix –Check out this super-healthy, clean-eating ranch dip (or dressing) using this favourite not-so-secret-anymore ingredient: cottage cheese! 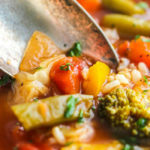 Vegetable Rice Soup (21 Day Fix) from spend with pennies –Loaded with fresh veggies and a ton of flavour this soup is the perfect healthy lunch! 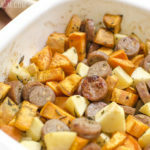 Oven Roasted Chicken Sausage, Sweet Potato, And Apples from unoriginal mom –this recipe because not only is it incredible easy, it’s a really healthy and nutritious meal that I feel good about serving to my family. 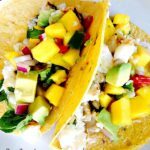 21 Day Fix Fish Tacos and Avocado Mango Salsa from confessions of a fit foodie – Fresh, simple ingredients with the a restaurant quality meal. Who needs to go out, right? Actually, I do but that’s a different story…. 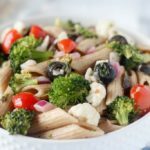 Healthier Greek Pasta Salad (21 Day Fix Friendly) from blackberry babe –This Greek Pasta Salad is super healthy and light, and fits perfectly in the 21 Day Fix! I use it as a side dish, but you could also add grilled or roasted chicken to it for a very simple meal! Serve it chilled. 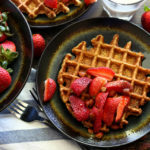 Healthy Gluten Free Banana Oat Waffles from Kim’s cravings –light, crispy-on-the-outside, fluffy-on-the-inside, clean eating waffles. They will satisfy your waffle craving while you stay on track with health/fitness goals! Make-ahead Salad Recipes & A Salad Dressing Recipe, Too! from Carrie Elle – a little bit of planning makes a world of difference! 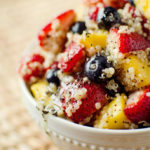 Fruit & Quinoa Salad With Citrus Poppy Seed Dressing from the creative bite –perfect for a side dish but is hearty enough to stand on it’s own as an easy lunch you can pack for work. 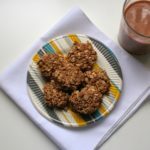 Oatmeal Walnut Cookies from the Surznick common room – 4’clock cravings are no match for these delicious cookies! Bet you can’t eat just one. 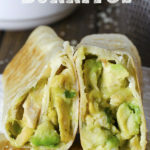 Chicken Avocado Burritos from omg chocolate dessert- swap out the sour cream for salsa and this one satisfies a hankering of Mexican any day of the week! 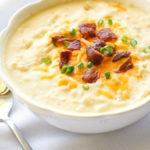 21 Day Fix Cheesy Potato Soup from stephaniebrijbag –for when you are craving soup that is so delicious, but you don’t want to screw up your 21 DF meal plan?! Try this…. 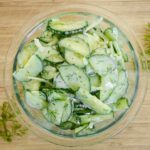 Cucumber and Dill Summer Salad from simply anchored –All you need is a large cucumber, fresh dill, half a sweet onion, greek yogurt, and salt and you will have yourself a nice and light BBQ side! 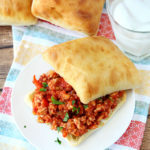 Healthy Sloppy Joes from Kim’s cravings –These are waaaaaaaay better than the old Manwich Sloppy Joes you may remember eating as a little munchkin. 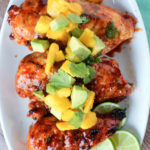 Sriracha Glazed Chicken With Mango Avocado Salsa from blackberry babe- grilled chicken dish with a sweet and savoury glaze, topped with an easy mango and avocado salsa. 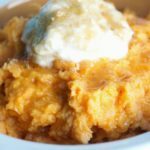 21 Day Fix Skinny Smashed Sweet Potatoes from old house to new home- Sweet potatoes are one of my favourite foods that I never actually make. Do you have any foods like this? Ones you love but never think to make? We don’t actually make any type of potatoes all that often. I usually reach for pasta or rice when I am putting together the starch component of our meal, but this side dish is so good and so healthy that I think I will have to add it to our normal repertoire! 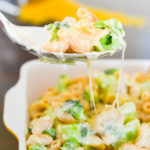 21 Day Fix Broccoli Mac & Cheese (aka The Perfect Mac & Cheese) from the foodie and the fix –It’s super-creamy, cheesy and filling, and dare I say it? The Perfect Mac & Cheese! As you can see, we are not short on variety or FLAVOUR here at our house! I have made this commitment for a healthy lifestyle not only for myself but for my family and part of that is creating delicious recipes that I know my family is going to love! Let me know what your favourite is! I hope you and your family enjoy these delicious dinners! WoW, All these 21 recipes look wonderful and I’m bookmarking them to try soon. My goodness thats an amazing selection!! Those fish tacos look delicious and the healthy sloppy joe would be a hit with my kids! Oh my goodness! There are so many great recipes here. I would love t otry the loaded pizza as well as the oatmeal walnut cookies. I need to bookmark this! We are doing our meal planning for the week this Saturday. Guess who made our meal planning menu a whole lot easier with this post? You did. Thank you for the suggestions. So many great options. They all look good. Prepping is one of the main points of staying on track with eating properly. These all look so good. I love that they are on the 21 day fix program. Healthy and good. These all look so good! I have never tried this diet but I will try some of these meals because they look great! I think my whole family would like them, thanks for sharing! I’ll be starting the 21 Day Fix again soon. This will be helpful in my meal planning. Thanks! These recipes all look so good! I’ve always considered the 21 day fix, but never actually took that step forward. I need to try it out, and especially now that I know that the recipes you can make with it are this appetizing! I literally want to make that entire meal plan! Haha It all look so delicious, especially all the cheesy recipes like pizza. Yum! Meal planning can be time consuming with all the different tastes and preferences in my home. This list has just made it much easier to plan! Thank you so much! I am beginning to collect all these recipes to begin a 21 day fix int he next couple weeks. These looks like great ones that I can actually enjoy the foods I want to eat. That vegetable rice soup looks like something I want to try immediately! Great list of recipes! I need to pin this to keep track. I have never heard of the 21 Day Fix, but this sure does look like it would be delicious. I am going to have to check this out more. Now that school is back in session I need more dinner ideas so I can better meal plan. Today is day 1 and I’ve failed already. What an awesome round up of healthy recipes! Everything looks yummy. I’ll be dropping by each and everyone. Wow, these are awesome recipes. This post is very helpful to me and I am so sure to other moms too. These all look good. I’ve been trying to try new things for dinner for my fam. I made mashed cauliflower the other night; my daughter totally thought they were potatoes. Well done you for reprogramming your lifestyle and diet you are doing a fantastic job. I like the sound of the vegetable rice soup! So much yummy food to be had. I love a good healthy meal adn snack. A lot of my friends are on the 21 Day Fix diet – I am definitely going to forward them this post. They sound delicious! These look really good! I’m always afraid of the idea of the 21-day fix because it seems like you can’t eat anything. This is so good to see so many options. Wow! So many delicious yet healthy choices! Your menu clearly shows that when trying to eat healthily you don’t have to starve nor eat only lettuce. Will add some of these mouthwatering recipes to our menu too! Yum, lots of delicious options! I’ll share this with my sister. She is currently doing a 21 Day Fix challenge. I did the 21 day fix workout but really didn’t commit to the food. Next round I am adding the nutrition part. Thanks for the recipes! When my mom was diagnosed with cancer last year, I completely overhauled our diets. I was already pretty conscious of what I should be eating, but not as aware of the ingredients in some of the food I buy. Now I’m read everything and we have switched to a more plant based diet. I’m not always perfect, but the change does help a lot. The waffles and sloppy joes look great and I’m betting they’d be a huge hit with my kiddos, too! This program is so popular and these dishes look fantastic! I love the diverse ingredients you can still eat too! I have never heard of the 21 day fix before. I have been paleo for 2 years now, but this looks like a great program for someone who doesn’t want to jump into a diet as strict as paleo but still wants to reprogram themselves. I would love to learn more about paleo! I didn’t realize it was strict but, when you think about it it’s a lifestyle choice and even if it’s a little restrictive at first you get used to it. At least I am assuming that’s so? I cannot believe all of those are allowed on the 20 day fix. I must make the tuna casserole. My 21 Day Fix Pals are going to Loooooove me for this find! I’m definitely pinning and sharing for their culinary pleasure. These are all great recipes that I would love to try. The Unstuffed Pepper Skillet sounds like a great recipe I can’t wait to try. Thanks for sharing the recipes. So many wonderful sounding recipes. I am book marking many right now as I write this. Thank you! SO MANY YUMMY RECIPES!!! I had to pin this post. I’m always looking for new healthy recipes to serve my family. I saw a lot of recipes I am wanting to try! Thanks for sharing with us. That ranch dressing made with cottage cheese is so intriguing! Oh my goodness! Thanks for ideas recipe! I’ll have to make a list for the whole week and I found this. These dishes look and sound delicious. I’d love to try the Sweet Potato Mashed and the macaroni and cheese. Actually, I’d like to try them all. Your recipes look so delicious. I like the idea of your 21-day fix. I need to tell my friend about your 21-day fix recipes. These are great recipe ideas. Thank you for sharing. These looks absolutely amazing! I would eat every single item! Yummy! I just shared your recipe with my friends via Facebook. They need to try your recipes to! Thanks again. 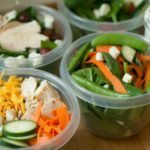 Meal planning can give me a headache and I would want to thank you for putting these meal suggestions in one post. I am going to bookmark this and start on some of them! Lots and lots of delicious choices in here! I’ve heard a lot of good things about the 21 day fix. I’d love to lose some weight. Thanks for sharing all these delicious recipes that are wholesome and nutritious. These are all great recipe ideas. I will have to make some soon, they caught my eye for sure. Bookmarking for later! Oh my goodness. So many amazing looking recipes here. I am going to have to save, take my time and go through them all. They are making me hungry! These recipes all sound so delicious! I can’t wait to try them! I need new dinner recipes that the family will love. I am bookmarking this to come back and peruse each reicpe individually.. Thanks for this. My SIL lost like 50 pounds doing the 21 day fix! Wozza..that’s awesome! Did she sign up for the competitions? She could earn money for that!! Oh my goodness, these are all amazing. 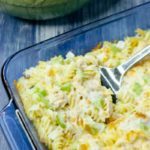 I totally have to try that macaroni recipe and the tuna casserole sounds great! I have heard so many great things about the 21 day fix. These recipes look really tasty too. That pizza sure does look good. It’s great to be able to grab so many great recipes in one place. I have my eye on several of these recipes and hope to make them soon. This looks so good. It gives me so many good ideas. They all look so tasty I cannot wait to try some of them. I know, so many great and healthy recipes here. The fish tacos really caught my eye though. Wow, these all look fantastic! Thank you for all of these delicious options! Oh my goodness! I have been looking for 21 day fix recipes. This is perfect for me. I am going to have to pin it. The Sriracha Grilled Chicken recipe is one I will have to try. Looks delicious. Great list! I am going to try the greek pasta salad! Sounds like something I could totally get my family to eat oddly enough too! These truly look delicious!! You are right, you are not lacking for yummy options. I also love that you can have them all planned in advance. I’ve been thinking about trying 21 day fix, these recipes look delicious! Yum! So many new recipes to try. These look great! All of these recipes look so delicious! I have been looking for some dinner inspiration too. Great list! I didn’t realize that there were so many delicious choices on the 21 day fix. I Love ranch Dressing & Pizza…seriously drooling! Now I have some new recipes to try. Wow! This list is incredible. I am seriously going to print it out and refer to this next month when the back to school craze comes back! All of these recipes look delicious. I think it can take time to change eating habits, I know from experience! I am glad you are feeling good about the changes you are making. What a great list of recipes! I can’t wait to try a few of them especially #18! Yummy!